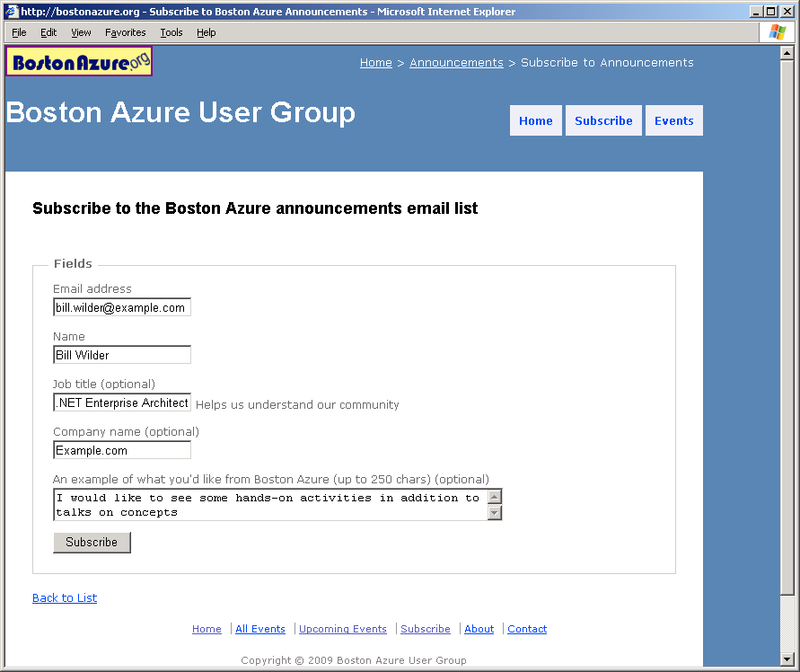 There is a “subscribe” form on the Boston Azure web site from which people can ask to be added to the group’s email list. I just made some updates to improve the user experience (UX). Here are the changes I made, and I list the handy web resources I used to help me decide (where applicable). For field labels, I place the label directly above the field it describes. I use <fieldset> and <label> to describe my markup, presumably making it friendly to screen readers. (Credit to templates provided with ASP.NET MVC for making this part easy.) This is the layout that Luke Wroblewski (author of Web Form Design: Filling in the Blanks) recommends in his Best Practices for Web Form Design for scenarios where you want to maximize speed, and the user is likely familiar with the data being requested. Since I have two required fields and three optional ones, I removed the (Required) labels, and stuck with the (optional) ones only. Added field length for optional Notes field. Made the Primary Action of the form (the Subscribe button) green, just like Apple Store (got the idea from UIE mailing). After the form is submitted, the user does not get an immediate email. I made that clear in the resulting text. Validate the data entered. In my case, this is currently only that a well-formed email address is provided. Provide more context on why data is being requested. Disable the Submit (Subscribe) button after it is clicked to avoid double clicks. Programmatically set focus to the first field in the form when the page is loaded. I used the jQuery technique described here. Dropped “:” (colons) at end of labels while also changing labels text from leading caps style to mixed case (“Job title” instead of “Job Title:”). While not decisive for me, I found an interesting discussion around whether to use a colon in form labels. 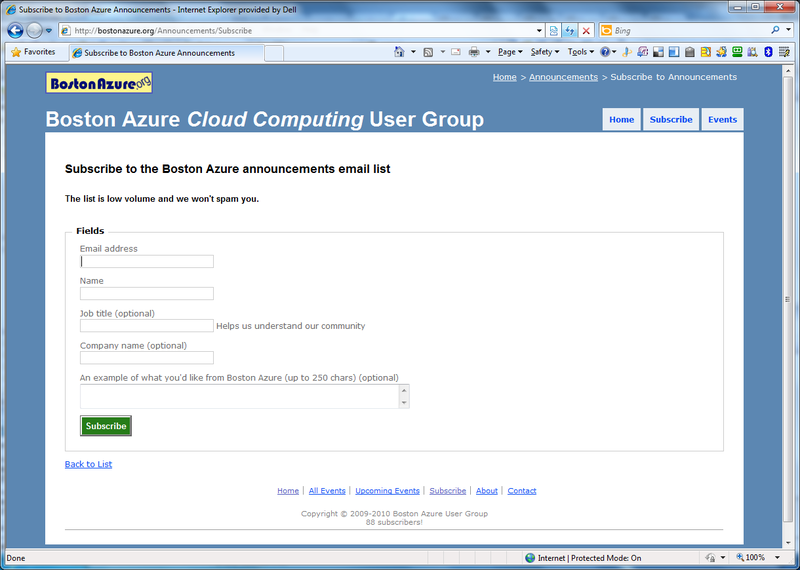 This entry was posted in UX, Web development on bostonazure.org on March 11, 2010 by Bill Wilder.